Hey, wanna see my mesh. 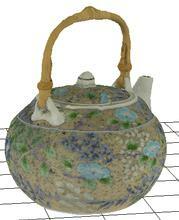 "adding 3D effect to web.."
Photo of original teapot being modeled. Wouldn't it be nice if there was a simple way of taking photographs of objects and magically transforming them into 3D objects? Well D Sculptor isn't it, but it does do a darn good job if you're willing to put in some work. D Sculptor is a new product from a new company called D Vision Works Limited in the UK. It was created by people with a whole bunch of photogrammetry experience and responsible for Geometra a previously reviewed product. D Sculptor doesn't work by finding corresponding points of objects in photographs like most of these types of programs. Rather you find corresponding points of a reference set of points, marks on a table and then you outline the object in each of the photographs. If you have a lot of photographs this can get quite tedious but quality is never easy to obtain. 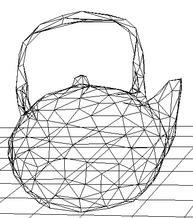 Object after outlining and mesh generation. Final 3D object with extracted texture applied. D Sculptor costs £500 (UK pound sterling) which is approximately $723 (US Dollars), it's not cheap but for a highly specialized modeling program like this, it's not bad either. 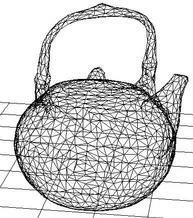 Position the object you want to model on a dot pattern. 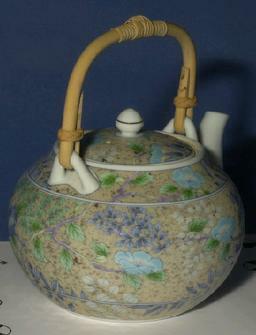 Take photos of the object from a number of different angles. Import these photographs into D Sculptor. Point out the dots on the dot pattern in each photo. Mark out the outline of the object in each photo. 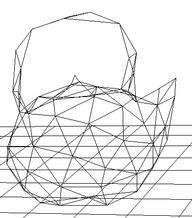 Let D Sculptor calculate the 3-D model for you. Export the 3-D model for use with other software packages as required. Marking the dot patterns is no big deal and just a tad tedious. Outlining the objects, as you might imagine, could be a horrendous task. It's no fun but it's made much easier by the addition of a "stiffness slider" that let's you use a slider which causes D Sculpt to help you identify the edge boundaries of the photograph. After you've gone through the photography, and dot patter matching and outlining process you can generate the mesh. On the bottom of the interface is a "P" and "M" for the two major modes. Photo mode and Model mode. Photo mode is where you do the outlining and pattern matching. Model mode is where you manipulate the model in 3D and refine the mesh. Also in Model mode you can adjust the rendering of the 3D object to display a solid object, flat or smooth shading. A particularly nice feature is a slider that let's you control the density of the triangular mesh. You can use this to generate levels-of-detail for use in your run time delivery system. 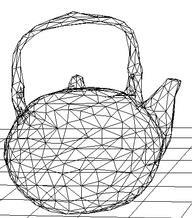 The following images illustrate teapots with progressively reduced numbers of polygons. The first contains 3000, then 1002, 504 and finally 105 triangles. An equally important feature is the ability of the system to extract a texture map from the photographs. 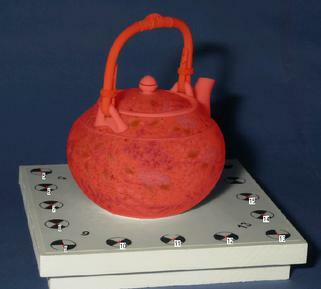 The original texture of the object is preserved and is mapped onto the mesh resulting in a photographic quality end product, the 3D model that looks like the real thing. Finally when you're all done D Sculptor has a rich set of export file formats such as: Direct 3D, DXF, Java (compressed Java graphics .cjg), VRML 2.0, Wavefront (.obj), JPG, BMP, TIFF. The D Vision Works web site contains a number of example screen shots illustrating a D Sculptor mesh used in Maya and Bryce. 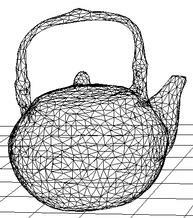 Happy modeling and may your meshes be efficient and all your polygons coplanar.